All students in grades 3 through 9 in the affluent Mineola, N.Y., school district have been equipped with Apple's iPad, in an aggressive and ambitious initiative that has converted some 75 percent of its students' instructional days to the touchscreen tablet. The Mineola Union Free School District, located in the New York City suburb of Mineola, is in the fifth year of an initiative equipping its students with iPads for the bulk of classroom lessons. The progress being made was detailed by Gail Robinson of The Hechinger Report, after she spent a day with 24 third-graders at Jackson Avenue School. The districtwide initiative keeps the traditional model of one teacher per classroom, but provides each student with their own iPad. For the third-grade class taught by Morgan Mercaldi, the students are "constantly" using their tablets for a variety of activities. That's not to say that pencil, paper and books are a thing of the past: Mercaldi's students still write reports on physical paper. But in an example of how the digital classroom is evolving, for one particular math lesson, the students use an application called Edmodo to communicate with the teacher and let her see their answers. Schools and students have been a major part of the initial success Apple found with its iPad after it launched in 2010. Though sales have slowed in recent quarters, Apple remains bullish on the platform, and has noted that users keep their iPads for longer than an iPhone, giving it a longer, PC-like upgrade cycle. 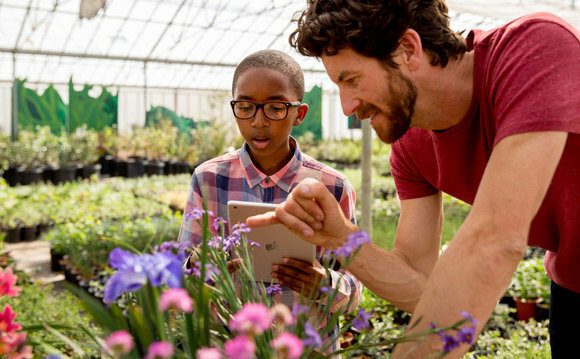 In an effort to boost sales, Apple is said to be working on major changes to its iPad in Education program, aimed at bringing down some of the barriers schools encounter when trying to deploy iPads in the classroom. Specifically, Apple is said to be planning to allow schools to distribute apps without assigning Apple IDs to each tablet, while in 2016, schools will be able to create and manage Apple IDs for students that can be used to access iCloud. Apple has inked a number of deals with school districts worldwide to use the iPad in education. But its most high-profile deal with the Los Angeles Unified School District was scrapped after officials caught wind of cost overruns, problems with students bypassing browser restrictions, and concerns about officials favoring Apple products without considering other options.